The 74VHC86 is an advanced high speed CMOS Quad Exclusive OR Gate fabricated with silicon Gate CMOS technology. 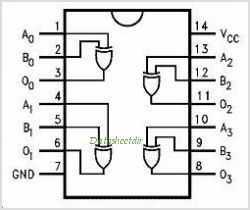 It achieves the high speed operation similar to equivalent Bipolar Schottky TTL while maintaining the CMOS low power dissipation. This is one package pinout of 74VHC86,If you need more pinouts please download 74VHC86's pdf datasheet. 74VHC86 circuits will be updated soon..., now you can download the pdf datasheet to check the circuits!